Onyx is a web-based application used to manage participant baseline interviews by assessment centres and clinics that are collecting data for research. Typically, the data is being collected for Biobanks or large-scale population studies. this figure shows the typical assessment centre activities that Onyx supports. 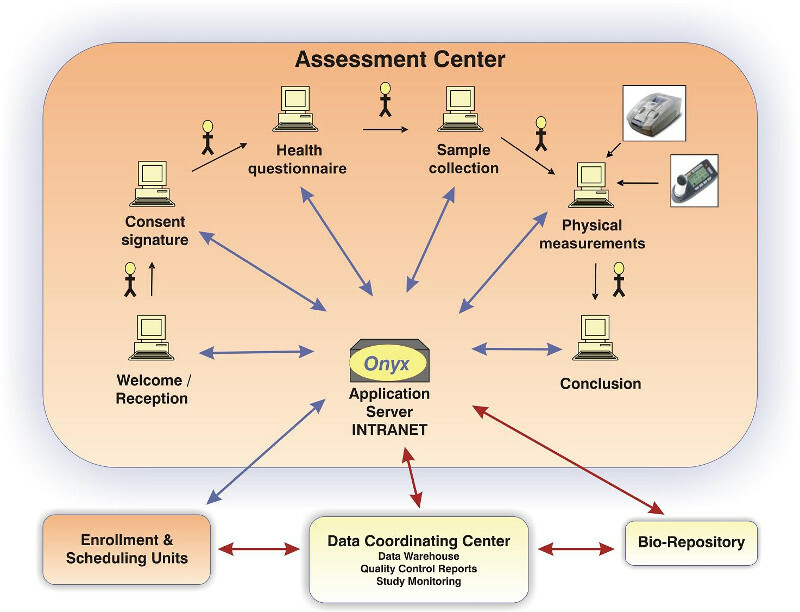 As shown in the figure, Onyx is installed on a server in the assessment centre and can be accessed from workstations via the assessment centre’s intranet. An assessment centre may have one or more workstations dedicated to collecting data using Onyx. Onyx is modular as shown in this figure. The Onyx engine is a backbone into which independent data collection components are inserted. Onyx is configurable which means certain stages may or may not be included in your version of Onyx. For example, your study may not accept volunteer participants. And if a stage is included, it can be fine-tuned to meet the requirements of your study. For example, for your study Onyx may be configured to only accept electronic signatures for consent forms, whereas for another study Onyx may accept electronic or handwritten signatures. Onyx is also customizable which means certain stages are tailor-made for each research study. For example, each study develops its own questionnaires, and each study defines which physical measurements will be collected and in which order.